Rally is a "relaxed" form of obedience. Many of the skills required are the same, but rally offers the ability to maintain verbal communication from handler to dog. 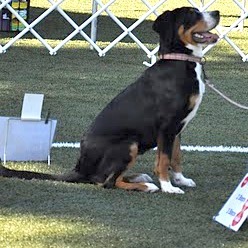 While Obedience is very "formal", rally is much more "informal", with a relaxed rather than precise heel position. Rally can provide a good starting point for handlers/dogs to move on to excel in obedience. If you are not sure about obedience, Rally is a fantastic place to start! AKC Rally is the new dog sport that is taking the nation by storm, a successful stepping stone from the AKC Canine Good Citizen® program to the world of obedience or agility. Rally offers both the dogs and handlers an experience that is fun and energizing. The canine team moves at their own pace. Rally was designed with the traditional pet owner in mind, but it can still be very challenging for those who enjoy higher levels of competition.